Because they are handstamped, handstamped overprints are infinitely variable: the way the clerk inks the handstamp can vary infinitely (pressure, angle etc) and the way he or she applies it to the stamp can also vary infinitely. That causes problems for the would-be Expertiser. My own strategy is to start with the things which are not infinitely variable. (1) The Handstamp. What is the genuine handstamp made of? Wood, metal or rubber? If you can work this out, you can also work out what a genuine strike of the handstamp is likely to look like. Quite often, forgers will use the wrong material to make their own handstamps - say, rubber instead of wood. And it is then possible to say that something is a Forgery because you can see that it is made from a rubber handstamp not a wooden one. You don't have to look more closely. (2) The Ink Pad. In general, for any one handstamp only one or a few ink pads will be used by the post office clerk. If they are re-inked, they will be re-inked from a limited supply of bottles. Forgers producing small batches are likely to use just one ink pad and one bottle - and, in many cases, it is immediately recognisable that the ink they have bought from the local shop is just plain WRONG. You don't have to look more closely. (3) The Basic Stamp. Remarkably often, forgers use the wrong basic stamp - maybe a forgery or a reprint or a later printing of a stamp which was used to make the original overprints. If the overprint can be dated to 1918 and the stamp was not printed in such-and-such a shade until 1920, then you know you a re looking at a forgery if the stamp is the 1920 version. Starting this way reduces the number of stamps you have to look at closely - most Forgeries can be dismissed at a glance. The real art needed to assess the few that can't is to find features of the genuine handstamp which tend to show however the clerk inks the handstamp and however he or she applies it. For this purpose, it is really helpful to have a large multiple showing the same overprint. 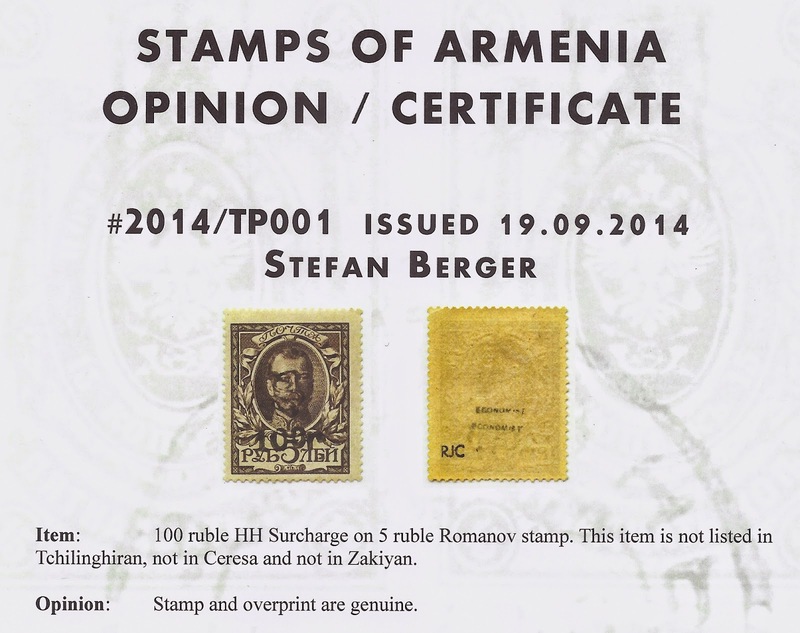 For example only, suppose that the handstamp is the number and value "100 r". You may find that however much the strikes differ, the gap between the "1" and the "0" and the gap between the "0" and the second "0" remains the same - when you allow for the slight differences between heavily inked and lightly inked strikes. You may also find curious things like this: maybe a tiny part of the second "0" almost never seems to print whatever the way the handstamp is struck. There is clearly some small defect in the handstamp - an area which is a millimetre below the level of the rest of the handstamp and which only fills up and shows when the handstamp is very heavily inked or struck. I may add that books by Roberts & Greaves mention the dimensions of many Ukrainian Trident stamps - up to 1/4 of a mm. What Can We Learn from Philatelic Covers? Ryazan 1919: Dream Cover or Philatelic Cover?